Massage Therapy restores vitality and delivers relaxation, pain relief, and sports recovery. 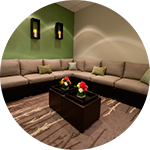 Our therapists draw from a variety of styles and techniques, and will customize each session to achieve your individual goals. Bring a partner and enjoy your massage together in our Serenity couple's suite. Purchase six pampering massages at a discounted price. Advanced body work customized with pressure point, deep tissue, sports massage and stretching techniques to address specific concerns. Purchase six enhanced massages at a discounted price. Indulge in a spa therapy using the Native American technique of applying warm, smooth stones to release a soothing energy and enliven the spirit. 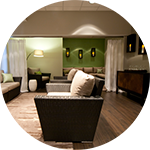 Relax with a massage that will enlighten your senses with aromatherapy oils. Available in our Couple's Massage Suite. Safe and soothing throughout your 1st, 2nd & 3rd trimesters. Using warm hand-carved salt stones from the Himalayan Mountains may balance central nervous system and nourish depleted cells leaving the body in a deep sense of relaxation. Focused massage of the scalp, face, neck and shoulders to relieve headaches, TMJ pain, Sinus pressure and neck pain. Deep tissue work on the postural muscles to improve posture, relieve muscle fatigue and undo the damage of extended hours in front of a computer. Focused deep tissue massage on the hands, arms and neck to relieve carpal tunnel and related problems such as golfer's and tennis elbow. Focused deep tissue massage on the lower back and hips to relieve chronic lumbar pain. Concentrated work on the glutes, IT band and all major muscle groups used in marathon training or any sports activity. Includes stretching combined with tissue stimulation to restore blood flow and flexibility and aid in recovery.